For years, the Majorana Demonstrator laboratories and machine shop bustled with activity. Dozens of collaboration members worked on various elements of the experiment— from electroforming copper to building a shield to machining every component for the detectors and cryostats. Today, nestled deep within its six-layered shield, Majorana quietly collects data with just a handful of team members to ensure things are working. The Majorana Demonstrator uses natural and enriched germanium crystals to look for neutrinoless double-beta decay. Such a discovery could determine whether the neutrino is its own antiparticle. The Large Enriched Germanium Experiment for Neutrinoless ββ Decay, or LEGEND, collaboration was formed a year ago and includes members of the Majorana Demonstrator collaboration, the GERDA (GERmanium Detector Array) collaboration, and other researchers in this field. 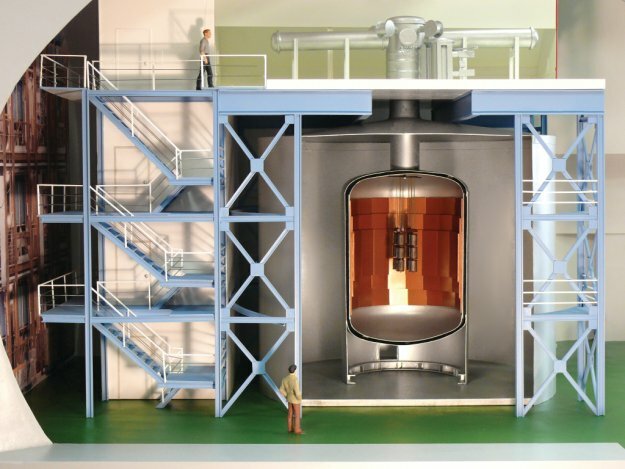 The GERDA experiment has been proposed in 2004 as a new 76Ge double-beta decay experiment at LNGS. The GERDA installation is a facility with germanium detectors made out of isotopically enriched material. The detectors are operated inside a liquid argon shield. The experiment is located in Hall A of LNGS. GERDA and Majorana are searching for the same thing, but they’ve used different technologies to reach their goals. For example, where Majorana used electroformed copper and built a complicated six-layered shield to keep backgrounds out, GERDA used commercial copper and shielded its detector inside a tank of liquid argon, which scintillates, or lights up, when backgrounds enter. The LEGEND collaboration wants to scale up to 1,000 kg of enriched germanium. By comparison, Majorana and GERDA each use approximately 30 kg in their experiments. But the plan is to start smaller, with a 200-kg experiment. “LEGEND 200 will be the first incarnation and will be the roadmap to get to the ton-scale experiment,” Guiseppe said.